Clearly Phrygian and Armenian are very different IE languages and Armenian does not stem from a form of Phrygian. Another issue is that the Balkan origin of both Armenians and Phrygians is seriously contested. It is not clear when and from where they arrived their respective locations; they may have been established in their respective locations earlier (during the Bronze Age) than previously thought. Very interesting. Obviously, I like the use of Balochi a lot more than that of Burusho (although there is still the problem that Armenians don't have any K7b or K12b South_Asian - so whoever they admixed with, was surprisingly free of South_Asian and East_Asian, for the time). How do you envision West_Asian entered Europe, then? In a patchwork over space and time? It can't be "~globally" with IE if IE speakers largely were still Sardinian-like in parts of the Balkans, and it can't be with the early-to-mid Bronze age, either, for the same reason - unless it entered in pockets here-and-there, while sub-populations only admixed during the iron age. In fact, the Armenian story also seems to suggest that admixture with remote populations in East Anatolia to Iran+ also only happened in the Iron age. Evidence/argument-free categorical statements like that are not allowed here. "Use facts and arguments. " "Evidence/argument-free categorical statements like that are not allowed here." I thought that this fact was so well known that we didn't have to add any further details. Phrygian was just a centum language, while Armenian is a satem language!!! The hypothesis connecting Armenian with Thracian probably won't be far from the truth. I did not present evidence because the fact that Armenian and Phrygian are clearly distinct languages is not in dispute. Their relationship to each other is at most like the relationship of Greek and Armenian to each other in the Greco-Armenian hypothesis. Also, Phrygian is phylogenetically closer to Greek than to Armenian. Any further evidence/argument-free opinions will be deleted. Dieneke, your Armenian = a form of Phrygian argument rests solely on a vague reference from Herodotus. The relative similarity of Phrygian to Greek was already noted during the Antiquity (see Plato). But Armenian, to my knowledge, was historically never likened to Greek or Phrygian by speakers of those languages. I am including my English transation and Russian original as well, not sure if it shows up here. it is well known book by Dyakonov. «С учетом всего этого, не может быть и речи о близком родстве фригийского с армянским; все имеющиеся совпадения охватывают большее число языков, чем эти два и притом таким образом, что нет возможности делать вывод об особых родственных связях между этими двумя языками». с. 408 сборника «Древние языки Малой Азии» под ред. Дьяконова И.М. и Иванова В.В., Москва; Прогресс, 1980 г. "Phrygian was just a centum language, while Armenian is a satem language!!!" The lexical table at the bottom of this article shows both satem and kentum items. So the language is both. And considering what a grab bag the lexicon appears to be, it's not surprising to find this kind of thing. There appear to be a lot of structural differences between Armenian and Phrygian, to the extent Phrygian is even known, but they appear to be no greater than the differences between Anglo-Saxon and proto-Germanic (about the same distance in time as between Classical Armenian and Phrygian, luckily as far as making comparison is concerned), or Modern English and proto-Germanic. One difference is exactly analogous - both Modern English and modern Armenian don't have noun gender. This happens to be a good example of how misleading structural features can be in determining genetic affiliations between languages. If we accept for the sake of argument that Dienekes' hypothesis is correct about the time and direction of the arrival of the "Armenians", the Balcan settlers for now, then they were mixed with a population that was already here, possibly for a long time. The connection to the Balochi is possibly much older than the mixing caught by this rolloff. So there is no South_Asian in the Armenians because there was no South_Asian in the other source population. Either because Balochi were a receiver of that population as well as the "pre-Armenians" in the Highland or the South_Asian admixture of the Balochi is later or the combination of this two. What is clear that the population of this region was mixed multiple times and some of the source populations becama further admixed since then too. The choice of reference points heavily influences the results and even if we can handle that, there is inevitable blur. By the way, my source is not quite reliable, but it says that Y Hg I2a has an elevated level on the Armenian Highland. This is compatible with a migration from the Balkan, does not say anything about the time of that migration however. Diakonov derived PIE from the Balkans. Also, I'm not at all confident that it is possible for more linguistics to speak about close relationships between Phrygian and Armenian, since both languages are very poorly attested. (Armenian less so, but with lots of vocabulary replacement). In any case, Herodotus wrote in the 5th c. BC, only a few centuries after the Phrygians moved to Asia, and he speaks of the connection between Phrygians and Armenians matter-of-factly, even though he often presents alternative ideas about historical matters. So, I have very little doubt that the relationship between Phrygians and Armenians was not controversial at his time. Irrespective of whether the Armenian connection with Phrygans in particular was the case, there is no doubt that Armenian came to Asia from the Balkans, since it is not closely related to Anatolian languages, not attested in early times, related at least to Greek, and has every indication of being an intrusive language in the area it later came to occupy. But Armenian, to my knowledge, was historically never likened to Greek or Phrygian by speakers of those languages. Comparative linguistics weren't invented in antiquity. - It is very commonly accepted that Greek and Armenian are mutual relatives within the context of extant IE languages, forming a Graeco-Armenian clade. - The ancients, who generally didn't notice these things, did notice a relationship between Phrygian and Greek. - There is very ancient testimony about the relationship of Phrygians and Armenians. It's pretty much a slam dunk in my book, and the signal discovered in this post is consistent with it, although as I said this can only be confirmed by ancient DNA research. Ethnic Groups in Mesopotamia to the Oxus Region. Armani/Armanum is mentioned in the inscriptions of Akkadian King Naram Suen (Sin) around 2,300 BCE. Naram-Sin recorded the Akkadian’s wars against the Armani or Armeni people in Ararat. The Armeni is a reference to Armen who was the ruler of the Armenian tribe (Armen’s followers, the Armenians [Uraštu in Akkadian language], were referred to as Armeni or Armens at the time). It is also unknown if Sargon, grandfather of Naram-Sin, and Manishtushu, father of Naram-Sin, also fought against the Armeni people of Ararat during their rule of the Akkadian Empire. It is highly probable however considering that Naram-Sin recorded multiple wars with the Armeni people of Ararat. It is not known at this time if war with the Armeni people of Ararat contributed to the collapse of the Akkadian kingdom. However, the Akkadian Empire was already starting to crumble during the reign of Shar-kali-sharri, the son of Naram-Sin, and by the end of his reign the empire collapsed outright from the invasion of barbarians of the Zagros Mountains known as “Gutians.” Some speculate that a bad harvest, climactic change or even a giant meteor contributed to the decline. As per the rules: "Do not post back to back comments in the same thread"
Hittite inscriptions deciphered in the 1920s by the Swiss scholar Emil Forrer,Hugo Winckler (German archaeologist and historian) and Bedřich Hrozný(Czech orientalist and linguist) testify to the existence of a mountain country, the Hayasa, lying around the Lake of Van/Armenian Highland. This was confirmed decades ago. As with Phrygian, the proximity between Greek and Armenian seems to be rather over-emphasized. Relative to the immediate affinity of Greek and Phrygian, Armenian is genetically equidistant from both. The Paleo-Balkanic languages (Thracian, Dacian, Phrygian, Illyrian, Venetic, and Paeonian) are all fragmentarily attested and cannot be reliably categorized. Consequently, all higher-level groupings are equally speculative. However, the convenience of dated schemas often overshadows the purely linguistic evidence.The relation of the Phrygians to the Armenians remains uncertain, not in the sense that they are not related at all, but in way they are related. There's obviously a common prehistoric language relationship but there's no linguistic way to estimate when and how the two languages diverged from each other. Why Did Herodotus Think the Armenians Were Phrygian Colonists? The Armenian Review, VOLUME 44, Number 3, Autumn 1991. The presence of the so-called Sardianian component in the otherwise West-Asian Armenians is indeed fascinating, and incorporating genetics in the study of Armenian ethnogenesis is a must. However, considering the linguistic and archaeological ambiguities, I would be cautious before writing it off as the signal of a one-off migratory event, rather than the remnant of continuous reciprocal movement across the Anatolian peninsula. The links I provided in my previous post pretty well summarize the consensus view of linguists regarding the position of Phrygian within the IE language family. According to the consensus view, Armenian and Phrygian are pretty distinct languages and Phrygian is phylogenetically closer to Greek than to Armenian. Phrygian and certainly - however lately - Armenian are attested enough to determine their relative positions within the IE family. Irrespective of whether Greek, Phrygian and Armenian are parts of a branch within IE (it is far from proven BTW), it is clear that Phrygian is phylogenetically closer to Greek than to Armenian. The fact that Phrygian and Armenian are not from the Anatolian branch of IE and are not attested during the Bronze Age does not mean they were not spoken in Anatolia and the Armenian Highland respectively during the Bronze Age, as not many languages of those regions were put into writing during the Bronze Age (probably most languages of those regions were not written languages back then) and Anatolia was not a solely Anatolian IE or even IE speaking region during the Bronze Age (as is clear from the attested existence of non-IE languages such as Hattic and Kaskian in Bronze Age Anatolia). Even if Greek, Phrygian and Armenian have a special relationship within the IE, it can not tell us where (Anatolia or the Balkans?) and when their common ancestor was spoken in a satisfactory way. And, the Armenians do contrast with their Caucasian neighbors in possessing ~10% of the Sardinian-like Atlantic_Med component that South and Northeast Caucasians lack. Armenians contrast with their Caucasian neighbors in possessing ~10% "Atlantic_Med" component, but not with their Anatolian neighbors: Anatolian Turks too possess ~10% "Atlantic_Med" component. So there is nothing unusual in Armenians possessing ~10% "Atlantic_Med" component. According to the consensus view, Armenian and Phrygian are pretty distinct languages and Phrygian is phylogenetically closer to Greek than to Armenian. That the are distinct languages is irrelevant and has no bearing on whether or not Armenians were Phrygian colonists. Spanish and Italian are distinct languages, and yet Spanish is spoken because Spain was colonized by people from Italy. As for the relationship between these three languages, we should remember that we have contemporaneous evidence for Greek and Phrygian, and evidence for Armenian that is very late. Moreover, the Phrygians were within the Greek sphere of influence, while the Armenians were not, which further solidifies the case for a closer relationship. That is irrelevant, since Anatolian Turks also have well-known ancestry from the Balkans (including Phrygian and Greek, to name but two). Even if Greek, Phrygian and Armenian have a special relationship within the IE, it can not tell us where (Anatolia or the Balkans?) and when their common ancestor was spoken in a satisfactory way. When two of the branches are Balkan and one is not, when there is historical evidence for the movement of Phrygians into Anatolia, the weight of the evidence is definitely in favor of a Balkan origin of the group. Ultimately, of course, the origin may be traced to Asia, but the possible Early Bronze Age or earlier movement of Indo-Europeans into the Balkans has little bearing on the historically attested Late Bronze Age movement of Phrygians into Asia Minor. To be fair, doesn't the Sardinia component peak in the Arabian peninsula? It's higher among Semites than among Armenians, and in turn, higher among Armenians than Georgians or Northeast Caucasians. Maybe we're talking a southern, rather than western, source for the admixture. To be fair, doesn't the Sardinia component peak in the Arabian peninsula? It does not. The Atlantic_Med component is actually very low in Saudis. It's my belief that Armenian is derived from Cimmerian. It was a language related to the Balkan ones and that would explain the Balkan features in the Armenian language. The Hg I2a that is most common in the NW Balkans is a very specific and recent subgroup that may originate from East Germanic tribes that were caught up in the "Slavic" expansion - so it postdates any Armenian question by more than a millennium. I2c is a different story, but it is also so widely spread (almost circum-Pontic) that it is difficult to pinpoint a particular migration path, except that it likely originated very roughly in Central Europe. But, yeah, a route via Thracia and northern Anatolia seems very plausible. As to Armenian origins, if the immigrating population was only a (smallish) fraction during admixture, this could of course explain anthropomorphic and some linguistic continuity. Armenians generally have bigger thus more West Asian facial features than Sardinians. Also, Armenians are overwhelmingly brachycephals while Sardinians are overwhelmingly dolicho- or mesocephals. See my answer to this below. Moreover, the Phrygians were within the Greek sphere of influence, while the Armenians were not, which further solidifies the case for a closer relationship. Yes, but that influence largely postdates Alexander's conquests and thus cannot explain the already closer relationship between Greek and Phrygian compared to Armenian during pre-Persian, let alone pre-Hellenistic, times based on Paleo-Phrygian inscriptions from the times of independent Phrygia (most of our knowledge of Phrygian comes from the pre-Persian Paleo-Phrygian era). Add to that Plato's testimony, which is also pre-Hellenistic. I too tend to favor the Balkan origin of Phrygian, but with a difference: it may have been established in west-central Asia Minor already during the Hittite times and thus Phrygians may have been one of many poorly attested subject peoples of the Hittite Empire. As for Armenian, it too may have been rooted in the Balkans, but seems to be from a distinct branch of IE from that of Greek and Phrygian. What are you talking about? The Phrygians were neighbors to the Greeks long before Alexander's conquests. The Greeks were also acquainted with the Armenians, and there is no reason to doubt Herodotus' matter-of-fact statement about the relationship of the two peoples. Add to that Plato's testimony, which is also pre-Hellenistic. Again, what are you talking about? Plato's testimony is in favor of Phrygian being related to Greek and hence having come from the Balkans. The opposite is not possible because Phrygian appears very late in Anatolia (after Greek was already established in Greece). it may have been established in west-central Asia Minor already during the Hittite times and thus Phrygians may have been one of many poorly attested subject peoples of the Hittite Empire. That's possible, since the Phrygians were already attested as Trojan allies in the Iliad. But, one can't push the arrival of the Phrygians too far back, because otherwise the "poorly attested" part becomes unbelievable. What are you talking about? The Phrygians were neighbors to the Greeks long before Alexander's conquests. I am talking about the fact that Greek influence on Phrygians was much more limited prior to Alexander's conquests. Greek was not a lingua franca in Asia Minor nor was it an imperial language back then. The Greeks were also acquainted with the Armenians, and there is no reason to doubt Herodotus' matter-of-fact statement about the relationship of the two peoples. There is enough reason to doubt it based on linguistics. The Phrygian and Armenian languages are distinct enough to be labeled as phylogenetically well-separated languages. Another issue is that it is not clear what Herodotus means by "Phrygian" in that statement; is it ethnic Phrygian or person from Phrygia? I mentioned Plato's testimony as part of my demonstration that Phrygian is phylogenetically closer to Greek than to Armenian. Also I already stated that I find the Balkan origin - however early it may be - of Phrygian more plausible than the Anatolian origin. As for my thoughts on the possibility of the opposite idea, see below. Our knowledge of the linguistic landscape of the Hittite era Asia Minor and Armenian Highland is very sketchy and certainly unsatisfactory, so I would not put much stock in inferences made based on the existing Hittite era linguistic data from those regions. It is still possible that Phrygian and the common ancestor of Greek and Phrygian originated in Asia Minor, though, as I stated, I find the Balkan origin of them more plausible. Armenian too may have originated in West Asia. I mentioned Plato's testimony as part of my demonstration that Phrygian is phylogenetically closer to Greek than to Armenian. Plato says that Phrygian is close to Greek, he says nothing about Phrygian being closer to Greek than to Armenian. The Phrygian and Armenian languages are distinct enough to be labeled as phylogenetically well-separated languages. That is IRRELEVANT, because as I pointed out the fact that two languages are "well-separated" says nothing about their relationships. The language of the Romanians is well separated from that of Italians, and yet people speak it because the Romans paid a visit. Also, we do expect Phrygian and Armenian to be well-separated because the EVIDENCE for them is 1000+ years apart, which is more than sufficient time for them to diverge linguistically, and indeed, the Armenian language is written down 1.5ky+ after the arrival of the Phrygians into Asia Minor, and 1ky+ after they were already a distinct people. Yes, but as is clear from my previous posts, I mentioned Plato's statement only to bolster the consensus view that Phrygian is phylogenetically closer to Greek than to Armenian, which is, as I already made clear, based on linguistics and not based on Plato's statement. Phrygian was put into writing - this time with the Greek alphabet - also during the first few centuries of the Common Era thus immediately before Armenian was first put into writing. This Neo-Phrygian language was still a very distinct language from Armenian and was basically the same language as the Phrygian of the independent Phrygia of many centuries before (=Paleo-Phrygian) despite the many changes during the intervening centuries. So your 1000+ apart argument is wrong, hence your Armenian = a form of Phrygian argument is wrong too. First of all, thanks for your wonderful analytical work, it fills lots of gaps that academic research sometimes tend to overlook. 1- Who were the Armenians? The incoming Phrygian settlers? or the local people they have encountered? 2- what is the proportion of this mixture you have discovered? can your genetic analysis determine the magnitude of the colonization? large scale? small scale? 50/50? 3- who were the local tribes living in Armenia highalnds by the time Phrygians colonized it 3200 years ago? Some Jewish groups, the Ashkenazim and Sephardim, show strong West Asian-Mediterranean admixture. It would be interesting to see what what Roll-off says about the date of the admixture. "The Hg I2a that is most common in the NW Balkans is a very specific and recent subgroup that may originate from East Germanic tribes that were caught up in the "Slavic" expansion - so it postdates any Armenian question by more than a millennium." Former I2a in the Y2010 tree. The subclade divergence for P37.2 occurred 10.7±4.8 kya. The age of YSTR variation for the P37.2 subclade is 8.0±4.0 kya." You probably mistook it with one of its subgroups. Nevertheless, the page I linked earlier shows the Kurds with elevated level of I2a/I2a1, not the Armenians. I just brought it up as an interesting side story that may refer to some migration from the Balkan. Yes, the f3(Ashkenazi; Near East, Europe) signal is not negative, however, probably because of the drift that has affected the Ashkenazi population. 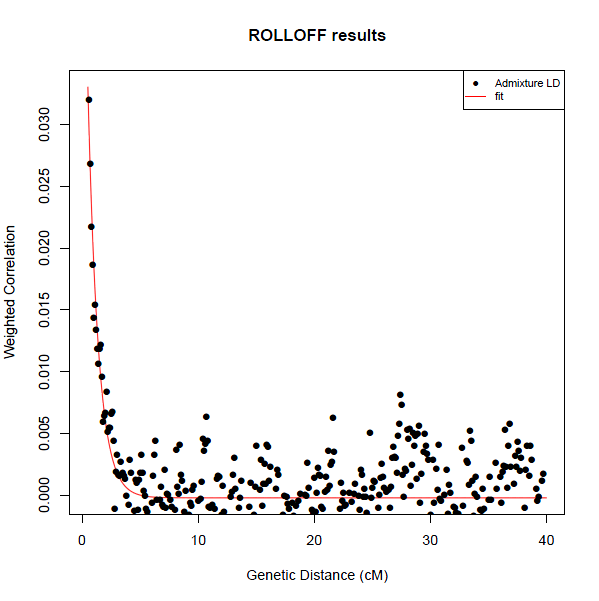 But it would be interesting to do a rolloff analysis which might confirm admixture if present. Onur, keep in mind that Armenian is a hybrid language with very strong Caucasian substrate. So it's no surprise that it differs from Phrygian proper. I hope that this analysis evited possible false intepretations taking into account the fragmentary knowledge of Phrygian, also there might be more characteristics to put aside both languages: at fist it was to me like someone saying "French is a satem language so its not related to centum Latin". By the way there are facts that show that Armenian didn't evolve in Armenia, as the old Hurrite and Urartian toponyms of the area, which haven't followed the phonetic evolutions of such language; also the supposed Urartian substrate found in Armenian is quite suspicious (many words shared with Assyrian, high-civilization loanwords but scanty words of local plants or animals). So Armenian is not from Armenia (OK, there was an Armani tribe, but actual Alvernians aren't speaking Gaulish, right ?... ), then, from where it came ? well, the most easy answer is given by Herodotus. There are some very strong ancient genetic links between Sardinians, Semites and North Africans. This signal also affects the Armenians to a greater extent than other populations of Anatolia and the South Caucasus. So there's no need to postulate a Sardinian-like substrata in the Armenians from a Phrygian source. I'd look for the origins of this signal in nearby Syria, or in the Semitic Assyrians. The Atlantic_Med component from your runs isn't relevant, because it includes an Atlantic component which is basically missing in Semitic groups. There is no reason to look for the exotic, now that we know that at the time of the rolloff signal there was a Sardinian-like population in the Balkans. The purest Semites (Saudis and Yemenese) largely lack the Atlantic_Med component, and Syrians possess similar amounts as Assyrians, perhaps from Hellenistic times. Certainly no reason to treat Syrians as a source for this component in Armenians. There is no "Atlantic" component. The Atlantic_Med component appears _the_ most unadmixed Caucasoid component. Which accords very well with what is becoming increasingly clear about it corresponding very well to an actual prehistoric population. "To be fair, doesn't the Sardinia component peak in the Arabian peninsula?" hmmm..think about it. If it peaked in the arabian peninsula it would no longer be "a Sardinian component". Doesn't make sense. As I understnad it Sardinian and Dienekes Atlantic-Med are NOT synonymous. "Oetzi turns out to be 57.7% "Atlantic_Med" and 22.3% "Caucasus" in this analysis". Sardinian may turn out to represent an ancestral population, but in my opinion Atlantic-Med is not. There is something wrong with that component, it behaves like a mixture IMO. Yes, if you wish read my sentence again as "The subgroup of Hg I2a that is the most common I2a ..." if you wish (that's why I didn't write I2a*). While I2a is quite common in the NW Balkans, almost all of it is this specific subgroup. I don't know of any I2a* of relevance, so clearly we must look at subgroups, and very deep ones, indeed. Armenians do not have high levels Y haplogroup I: only ~5% of Armenians possess haplogroup I, the same haplogroup I ratio as that of Anatolian Turks. So, just as in the "Atlantic_Med" component ratio, Armenians are not different from Anatolians in their haplogroup I ratio. On the hypothesis that Armenian is a highly creolized version of Phrygian as a result of contact with the Urartian language, that hypotheis cannot explain the satemization: Armenian is a satem language while Phrygian is a centum language, so in order to derive Armenian from Phrygian you also need a satem IE contact language in the formation of Armenian. The Iranic languages, which are well known to have had a very significant effect on the development of Armenian, may fit the bill here. Therefore, if Armenian is really descended from Phrygian or Greco-Phrygian (the hypothetical parent language of Greek and Phrygian), it must have formed as a result of a huge impact from the Urartian and Iranic languages. I am open to that possibility, though I need to further study the subject, especially the linguistic technicalities: are they compatible with such a scenario or not? I don't see anything wrong with this. The Thracian (and/or vicinity) admixture to modern Armenians seems to be low-ish, anyway. Neighboring Georgians aren't all that different autosomally (except for a few telling characteristics), with a completely different language family. Genetics is a secondary issue here. Much more important than it is linguistics. Is the scenario I mentioned linguistically plausible? I am pursuing that question. Genetics is a secondary issue here. Which is equivalent to my "anyway." At any rate, if it were not for the proposed (if not established) existence of very early Anatolian IE branches, a theory of a Balkan (W to NW Pontic) IE origin would be a slam-dunk. I hope we will find out the true story, but in any case I am sure it must and will involve very early trans-Pontic connections. On the flip side, all this makes it difficult to characterize rogue Anatolian IE languages. All of this can be settled with further archaeological excavations in Armenia and the Highlands, particularly in the 3-5 kya range. Comparison genomic data from the early bronze age to the iron age is our only hope of solving this confusion. With the evidence available, I don't see why Armenian must have originated as far West as the Balkans or the Western coast of Asia minor. It could very well have originated in Central or even Eastern Anatolia and then displaced with the Hittite rise to power. It's what happened to the Luwians, and other Anatolian people. Who's to say proto-Armenian didn't have such beginnings. We know that the Armenian language has a phonology most similar to that of the Caucasus, and we would be hasty to date the arrival of Armenians to the collapse of the Urartian Kingdom. The caucasian phonology indicates an intimate contact far earlier than the Urartian collapse. In essence, to tease out this tenuous history, we need genomic data from archaeological sites in the region. Too bad we have uninterested parties and limited funding for more extensive genotyping of modern and ancient populations. With costs coming down though, I estimate that in 5-10 years, we'll have a comprehensive picture of the temporal genomic landscape. I am pursuing that question. For example, is the satem structure of Armenian of Iranic origin or independent from it? If the former is true, this will bolster but not prove the hypothesis that Armenian is of Phrygian or Greco-Phrygian origin. If the latter is true, this will effectively disprove the Phrygian or Greco-Phrygian origin hypothesis, as it will mean that Armenian descends from an already satem parent language and not from Phrygian or Greco-Phrygian, which are centum languages. People more knowledgeable about Armenian and the Iranic languages may contribute with their comments here. Any help will be appreciated. I misunderstood you then. The linked site does not specify what subgroup the Kurds have, so I can't say too much about this. However I2a had to be present in the southern regions for ages, since its Sardinian branch is hardly East Germanic/Slavic. Also the mentioned most common Balkan version (I2a1b1a*) seems to be a way to frequent in to be a heritage of some caught up East Germanic elements, since its frequency practically zero in many other areas where East Germanic were documented. Anyway, I tried to look up the sources of the Eupedia map and now I am even more suspicious of its reliability. That's kind of the point, though, this is what happens during an expansion: a newly or recently created subgroup by chance gains a huge advantage - one can see the same effect in a few very specific Slavic R1a subgroups that stand out over other ones much more ancient in Eastern Europe (and that are not related to Slavic expansion). And it is a long way off I2a - most consider I2 paleolithic, and I in general is pan-European. This is why one has to keep in mind how deep on the tree one is looking when thinking about source locations and migrations. If you think of the main haplogroup designation letters as rather arbitrary (as they are), you can imagine in a different universe I2a1b may have been called U, a subgroup of T, a subgroup of S, etc. You don't know by the nomenclature how deep in the tree you are, exactly, in terms of actual time scales, or even in terms of number of mutations. In fact, many haplogroups are not as well studied as e.g. R1b - so one often can't really say much anything more recent than several thousand years ago. Worse, much of the early ancient DNA wasn't/couldn't be done at the high resolution possible today. For example, much European neolithic seems to be G2a. But which one? Ötzi may have been G2a2b - but is that really G2a2b1a2... etc? Who knows, at this point. About the Haplogroup I in Kurds, we have two out of 14 private participators who belong to Haplgroup I. Yet non of them is I2a but I2b and I1*! Its not clear what kind of origin the I in Kurds has. Of course it is possible that some of the I found in future might turn out I2a*. This topic shows just how persistent old paradigms can be. Despite the scarcity of the extant linguistic material, they are sufficient to conclude that Armenian cannot derive from Phrygian. Archeology provides even less support for a concrete Armeno-Phrygian connection than linguistics. The only positive evidence is Herodotus’ statement, which continues to serve as the main impetus of seeking a Balkan origin for Armenians, while remaining empirically uncorroborated. A historian as competent as Strabo -a native of Asia Minor and no doubt personally acquainted with Armenians- wrote that the Armenians, Syrians and Arabs were closely connected not only by physical and cultural characteristics, but by language as well (See Petrosyan, my comments above). Caution must therefore be exercised when dealing with ethnographic statements of ancient authors. That the Armenian people are the primary biological and cultural heir of the autochthonous element of the Armenian Highland is beyond question. Armenians are painstakingly Near Eastern, and along with the Assyrians, represent the most intact archaic West Asian population. The only real ambiguity is the nature and development of the Armenian language, which does not correspond conclusively to any particular historical coordinate. In other words, it is essential to discern that we speculatively seek the linguistic ancestors of Armenians. Allocating genetic signals to the framework of a dated scenario is taking the simplistic validity of that very scenario for granted. That, of course, does not mean that all possible links between the Balkans and the Armenian Highland are to dismissed, nor that the Armenian language can be thoroughly understood independent of the larger Indo-European system, yet the intricacies of ethnogenesis demand at least a more detailed account than what we are able to currently formulate. Strabo speaks about the similarity of the three nations in Mesopotamia, where they live side by side. For the nation of the Armenians and that of the Syrians and Arabians betray a close affinity, not only in their language, but in their mode of life and in their bodily build, and particularly wherever they live as close neighbours. Mesopotamia, which is inhabited by these three nations, gives proof of this, for in the case of these nations the similarity is particularly noticeable. There is no reason to doubt Herodotus' matter-of-fact statement about the relationship between Armenians and Phrygians. Of course, an ancient historian would not know comparative linguistics to perceive that Armenian is closely related to Greek and Phrygian and not to Semitic languages, so he would probably go by vocabulary, and, indeed, Armenian vocabulary has been largely replaced by non-Armenian words, and this effect would have been noticeable in the Mesopotamian Armenians Strabo speaks of. I might remind everyone of the so-called "Dinaric" / "Geton" / "Thracian" I2a2 found in the Balkans, which parallels the I2b1 found in Sardinia.